Soft Play Centres are a great place to ensure little ones burn off lots of energy and have lots of fun. Whilst they are a savvy option for when the weather is wet/cold, also if the place is air conditioned on a really hot day it can be a good escape from the heat too. Children seem to universally love Soft Play, but can be a headache for adults! So if you’re expending the energy, you want to go to a good one. We have either been to, and liked, the following Soft Play venues (road tested over the last year by my 3 and 2 year old for the purposes of this review), OR they have been recommended. Each title below is a link you can click to take you to the venue's website - so you can check the opening days and times (carefully, I have often been caught out as they can be unusual!). This is my closest soft play centre, it has good opening days and hours and we have been lots. It gets a big thumbs up from us and the kids actively ask to go there. The theme is pirates, hence the name, but it is not overly dressed up if your little ones are "land lovers, ooo arrr". There is an area for little ones with climbing section, little slides into a ball pit and a mini race track. For older kids there is a big climbing area including a ball pit, giant lego and very big set of slides. There is also an open space to ride the little self propelled scooter bikes. Around the sides are basic chairs and table set ups and there is a little café selling drinks and snacks. Along one wall are a number of semi open cabins, set up for birthday parties. The staff are very friendly and happily speaks a little English to us too. Importantly too, it always seems reasonably clean (I went to an awful soft play in the UK which was filthy). The toilets have always been clean too, and they provide a potty as well. Next to the under 3s area are baby change tables, which I think is really convenient as the normal toilets are the opposite end of the building. There are a few highchairs as well. Extra bonus - Cap Pirate is within the Aubergenville Family Village - which has lots of shops, including a designer outlet mall, and some restaurants. The Local swimming pool just around the corner is also excellent. You could make a whole day out of it here. A really striking feature of this venue is all the decoration. It is very colourful and fun and they have a really great logo of 2 little superheros. Les Zacrocs is in a big vibrant space. My favourite feature were the many comfy couches for supervising adults. Not that I was able to rest much as my nearly 3 year old wanted me to scramble around with him almost all of the time! For those with older children (for whom soft play can be a time to relax and drink coffee) there are magazines provided too. The area for under 3’s is a really good size. The big kids area is also very large, with balls, bricks, trampoline, elevated football/basketball area, 3 enclosed slides and one open slide. There are motorised cars which are a brilliant feature. At 2 euros for a short go the cost can mount up though with a pestering little one. Along the left hand wall there are some fun private Party rooms, all with different themes and really nicely decorated (e.g. circus). Toilets and separate baby change facilities that we used all seemed clean. I noticed 2 highchairs. We were really impressed by Les Zacrocs Soft Play. This is a chain of soft plays all over France. I have heard good things about my local ones, and I assume they are all of a similar standard. This is a big soft play with loads of variety and all the facilities you would expect for kids (including highchairs). There were some novel areas here for us, like some little climbing walls and a curious rollers slide - all of which were a hit with my 3 year old. There are lots of arcade type rides and games too, and a track for motorised cars, at extra cost per ride/play. There is a nice separate self contained area for the under 3s. As well as lots of seating for grown ups, there is a cafe for snacks and lunch which we didn't try but looked ok. There is also a separate party section with tables and chairs in. I really like the security doors to get in and out of the play area. My son enjoyed his morning there. Jump Fun offers something a little bit different to the usual soft play centres. It is outside and inside, and it has lots of things that other soft plays don't have. The inside is undercover but still quite open to the elements so this is a great place to visit once the winter chill has passed. 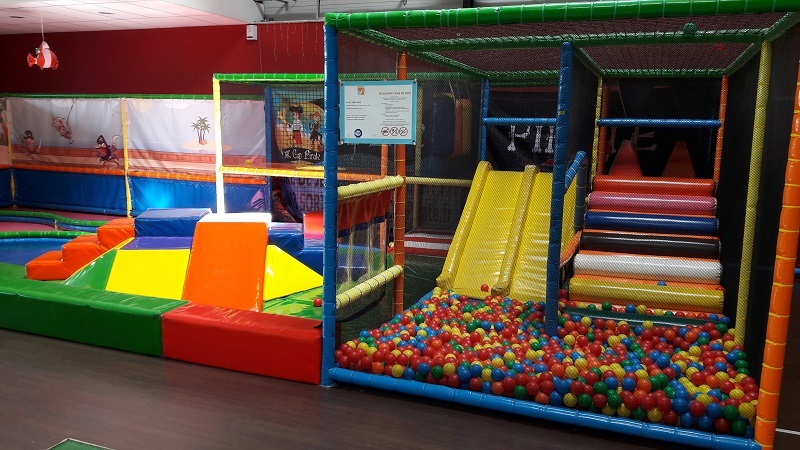 Photo of Chez He play centre downstairs - from their website. Pick your timing wisely. When busy these places are less fun…for parents! We went one Saturday afternoon to a soft play... The kids had a total blast but it was mayhem, a miracle we left with everyone accounted for and intact, and I needed a very large glass of wine once we got home! I think maybe it's because my two are so young though and need help and supervision - maybe with older children: busier = more fun?!! As with most French attractions, we tend to try and arrive for morning opening (usually about 10am) as our experience has shown that French parents tend to go to places later in the day. But as a cautionary note: always check the opening days and time, they vary quite a bit and I have been caught out before. If you have been to one of the soft play centres above that I haven't visited, and want to help other families then I would love if you could email me a mini review! Even better send a photo I can use. You can reach me here at fivelittlestars05@gmail.com. Also let me know if I have missed one that you would recommend! Don't forget, if you want more ideas for days out with children outside of Paris then here is a great list. Or here are some ideas for rainy days in Paris.